DCHM writer Tal is back with this in depth review of Baltimore based traditional/thrash metal band Omnislash’s sophomore album. Be sure to check out the video game inspired music video at the end of the post when you’re done reading. We’re pretty spoiled in the DC area with a good number of local bands that sound like pros, and yet somehow I’m always surprised when I find another one. Omnislash is one of those bands. I had heard of them for possibly years, but had never been in the right place at the right time to actually see them live. Their recent album Slash ‘Em All! convinced me that I need to change that ASAP. 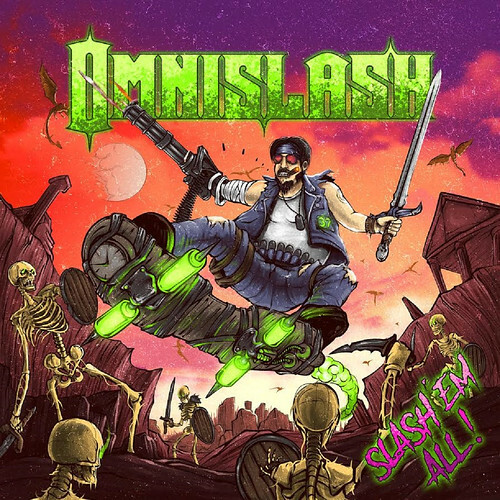 If Iron Maiden was a little faster and thrashier, that might describe Omnislash’s sound. They’re melodic like Iron Maiden, with mostly cleanish vocals, anthemic choruses and an upbeat vibe, but given to blistering thrash rampages. They at once claim to combine “the best elements of glam, thrash, power metal, death metal, hair metal, and classic rock” and to represent traditional heavy metal from “a time before the metal scene became fragmented.” I suppose if we hearken far enough back into the 80’s, it might be possible to do both at once. Certainly, Omnislash seems to combine all those diverging genres into one cohesive whole – thrash outbursts flow into expansive choruses, the vocals go from gritty to near operatic, and heavy riffs give way to melodic bridges or speedy solos, in such an organic way that nothing sounds out of place. After an acoustic/neoclassical intro, the album starts off with rocking riffs with just a little thrash dirtiness, and a vicious scream from vocalist Jeremy Phoenix. True metal, all right. The first song, “Empires Fade,” is exemplary of the album – at once melodic, groovy and touched with thrash grittiness, and impossible to sit still for. The vocal style, clean yet forceful and sometimes rising into a scream, is reminiscent of harder power metal bands like Iced Earth. In another parallel to Iced Earth, there seems to be a historical theme to the song, which I first noticed with the line “Rome controls the Nile.” In an interview in Shockwave Magazine, Jeremy indicated that the song is about “that moment in time when it could have been the Egyptian Empire but it became the Roman Empire.” The wailed, “Run for your life” in the chorus can’t help evoking Iron Maiden’s “Run to the Hills,” as well. There are several catchy songs you’ll be rocking out to in your mind long after the album’s done playing, but the catchiest has to be the title track (and band theme song? ), “Metalliation Revengeance (Slash ‘Em All).” With the racing, driving rhythm and insistent, somehow danceable lead guitar, you won’t be able to help starting a toxic waltz wherever you are. Then it goes into a horn-throwing, sing-along chorus and bridge, complete with “woah’s” for the full metal experience. But don’t take my word for it; check out their hilarious video at the end of this post. I can just imagine this as the climactic closing song of their live show. This is just the middle of the album, however, so the songs keep on coming. The most aggressive songs are in the second half: “Nuke the Moon” and “Not One Step Back,” the former about Project A119, a US Air Force project from the 1950’s that planned to detonate a nuclear bomb on the Moon, and the latter about the Battle of Stalingrad. There’s also a ballad of sorts, “Gothenburg,” if a song with pummeling thrash percussion and machine-gun guitars can be called a ballad just because it has more drawn-out and emotional vocals. “Blood Feud” is a song with furious aggressive verses and a catchy chorus that oddly reaches its anthemic height at the end of the chorus. Since I just finished reading Hillbilly Elegy, I can’t help wondering if the song has anything to do with Appalachia, since that book’s author, J.D. Vance, had some not-so-distant ancestors that took part in some pretty violent blood feuds in that area. The band’s lyrical themes are another parallel to Iron Maiden, with a more historical bent than most thrash metal, although they still focus on typical thrash themes of war and violence. One downside to the album, which might have been out of the band’s control, is that the production quality isn’t as good as I’ve become used to for some of our local bands. Some might argue that this is part of the band’s 80’s thrash vibe, but for me, it’s a detriment to the album. For instance, the furious beginning to “Nuke the Moon” sounds like a mess. It would be much more effective at showcasing the band’s technical virtuosity – not to mention more enjoyable as a thrash barrage – if I could hear everything going on. The rest of the album isn’t that bad, but it’s still poor enough that this is one of the rare cases where a pair of good headphones doesn’t help, and actually takes away from enjoyment of the album, since the sound quality issue becomes so distracting. Sound quality aside, Slash ‘Em All! 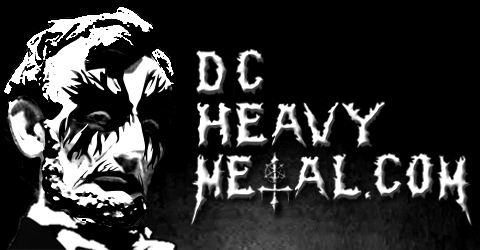 is a great album, putting Omnislash among the ranks of stellar local bands in the DC area.